The M4 became the weapon of choice of the modern battlefield today thanks to its well-rounded reliability and effectiveness serving the entire United States military and law enforcement branches, as well as other countries around the world. Actually the carbine version of the M16 rifle, it addressed and solved many of the issues to become a formidable and flexible weapon. 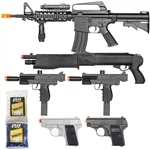 Following its popularity, M4 airsoft guns are among the most popular and versatile airsoft models available. From its original carbine configuration with its recognizable ribbed hand guards to its inclusion of Rail Integrated Systems (RIS), we carry a variety to choose from.